Electronic catalogs (or short e-catalogs) are digital publications that present products with the purpose of helping them sell. You’re probably looking for the right software of for design tips to help you create the best e-catalog for your business. 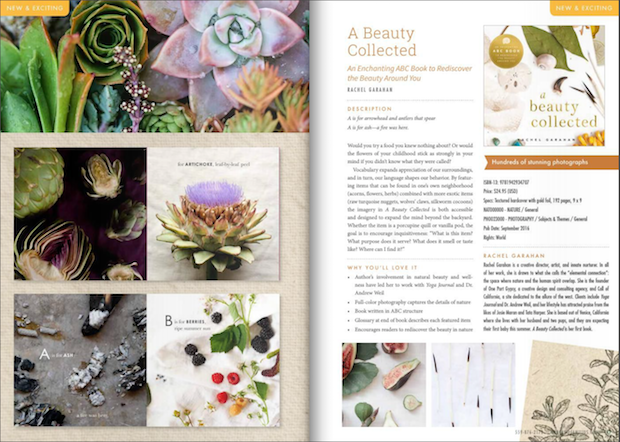 This article includes tips for design as well as other useful suggestions for making your digital catalog. All good projects start with a bit of planning, and your electronic catalog is no different. You need to plan ahead what goes inside, from product collections to texts and images. It’s the step that no one should skip. Decide what products you want to include in your e-catalog. Put together a flatplan to show how you want the texts and images to be laid out on the page. It’s up to you how many items you want to advertise in your electronic catalog. It can be a seasonal collection of 15 pieces, or a large collection of 500 items. But remember: the bigger the collection, the bigger the e-catalog should be. There’s no point in squeezing 50 products on a page – that’s no longer a catalog (at best, it’s a price list). It defies the very purpose of the catalog’s existence: to present products in an attractive way. You also need to consider how you group your products, what order they will appear in and what products you want to be highlighted. Photos are the bread and butter of your catalog: no photos, no appeal. If possible, include some pictures of models wearing / interacting with your products. It’s a nice trick to make your products look more attractive and accessible. A little bit of copy goes a long way in highlighting the most enticing aspects of your offering. Even though there’s usually not a lot of texts in catalogs, it’s still something that you should consider. Don’t forget to include names, prices and links for each item, and also the brand contact details. More about the key elements of the e-catalog design below. If you decide to include texts or product info in your e-catalog you should hire a copywriter, and make sure you provide him/her enough information for each product. The planning phase includes decisions that the marketing department should make (or at least should be involved in the decision making process). This is when your project goes from the marketing team to the design department. In smaller companies you may not have separate teams, just different employees. That’s ok. It’s also fine if you are a one man show. The principles are basically the same, no matter how many people get involved. The e-catalog design should match the overall aesthetic of your brand. If you don’t have a brand guidelines manual, you should make it a priority, because it will help in many ways, in all your projects. Tailor it to the brand audience. Keep your customers in mind throughout the entire design process and let that guide your decisions: style, colors, imagery. Place the most important products on the first pages, because those are the most important pages in e-catalogs. This is one way in which e-catalogs are different from printed ones, where the front and the back covers are the most valuable. Readers interact with digital magazines differently. Avoid clutter. Don’t place too many products on one page. It’s not eye-pleasing and it’s not very efficient. Avoid busy backgrounds. You want the product the get all the attention, not the background. Use big images because they attract more attention than small ones. Design in spreads, not individual pages. That’s how readers will see the catalog after you publish it, so by taking that into consideration, you’ll be able to deliver a design that is visually easier to process. Consider the eye flow when you design. The eye movement generally starts on the top left and it moves diagonally across the double spreads. The copy needs to be just below the product image or to the left. It’s not just the standard practice, it’s also how people mentally associate the text / product info with the image. This example illustrates pretty well how you can use a model to present your products. 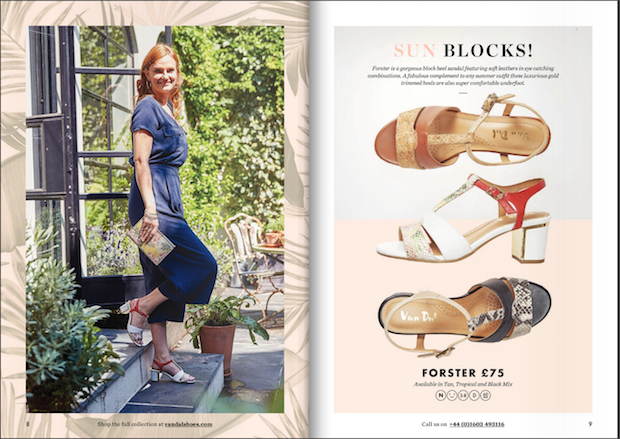 On the left page you have a woman wearing the sandals (an idea of how to wear and style them) and on the right you see the 3 versions of the sandals, the name, description and price. There’s even a call to action at the bottom of each page, and all images are clickable. Supermarkets often present their special products and deals in weekly catalogs, which are often poorly designed. Aldi Spain is one of the exceptions. Even if you don’t speak Spanish, these images and prices offer enough information. In this case there are no links, because the products can only be bought in the supermarket. This example is very different compared to the others. It contains a lot more text, but it’s a smart idea. When it comes to books, readers want to read a summary or a review before they decide they want to buy. The digital catalog lists all the information readers might be interested in: price, specs, description, author description. All the texts on the right are nicely balanced by the beautiful illustrations on the left. This layout features dual language texts, product images, ingredients information and benefits. With cosmetics, product images are usually paired with pictures of female models. Though we don’t have that in this particular layout, you can see them on other pages. As soon as the design stage is over, you need a way to display it online, integrate it into your website and share it with your business partners or buyers. In other words, you need an e-catalog maker. There are many e-catalog maker tools on the market, some online, some offline. I think the ideal option is to go for an online tool, because you won’t have to install anything on your computer or search for a hosting solution for your electronic catalog. The leading e-catalog services on the digital market are: Flipsnack, Issuu, FlippingBook, Joomag, Yumpu and more. We recommend you to try our e-catalog creator, Flipsnack. It’s very easy to use and there are great advantages in using it. It will turn your PDF design into an HTML5 e-catalog, so it will work on all devices, including smartphones (we all know how important that is, right?). Your publication will be super interactive, meaning that you can add promotional videos, links, captions and shopping carts on pages. This Accessorize catalog was uploaded to Flipsnack as a simple PDF. All the interactive buttons and elements were added with our e-catalog creator. You can create something similar, easily! All electronic catalogs should have links inside, because there’s no better way to point buyers to your shop than through links. 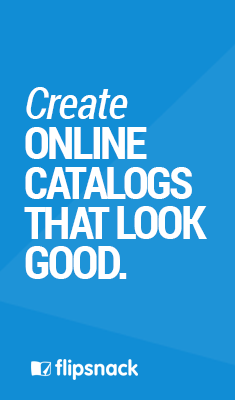 Add them after the design stage with the help of your e-catalog software. This is something that you can easily do with Flipsnack. Another trick that can boost sales is to pair the link with a call to action. It can be a short text on a button, or simply a text below the product description: Buy this, Buy now, Shop this look, More details etc. Simply apply a transparent overlay on top of the text and link to the product page on your online shop. Make it as easy as possible for people to buy from you and turn your electronic catalog into a proper sales tool. When you publish your e-catalog online make sure you set it public, so that it’s easy to find online. Your e-catalog maker should give you this option (I know Flipsnack does). Everything that gets published through Flipsnack (with the exception of private publications) is indexed by search engines. You should set a relevant title and description right before you hit Publish, because that is what will appear in search results. The meta title and description will influence your ranking and clicks. Once it’s published online, you just need to let customers know about it. One of the best way to let your customers and prospects know about your new collection is to send an email newsletter that links to both your catalog and your online shop. Those who wish to buy directly can visit your shop, but many will want to see the catalog first, to view your entire collection. Paste the direct link on Facebook and other social platforms, to announce the release to your followers. These are all the steps that you need to take in order to produce a quality e-catalog that looks great and brings in sales. I hope that this guide will help you: designer, marketer or business owner, in creating successful electronic catalogs. Previous Post How to create a brand book. Guide and examples.